fantasy art and tree chatter of aquariann: Treasury Tuesday: Let's Go To The Renaissance Faire! Treasury Tuesday: Let's Go To The Renaissance Faire! Last Saturday, Ogre and I journeyed to the Maryland Renaissance Festival for the first time together. I'm surely not the only Fantasy Artist of Etsy that shall be spotted this faire season. If you're not planning a trip yet, join Lithia on her adventure and you just may change your mind. 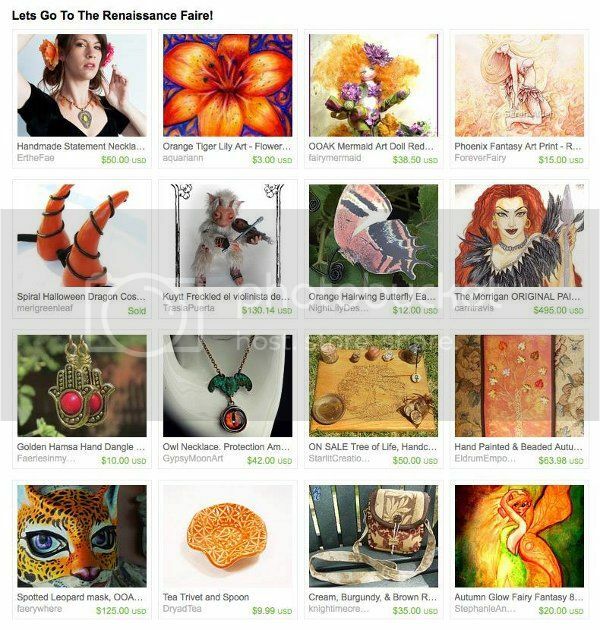 Her fantasy gift ideas include dragon costume horns by Elfling Creations, butterfly ear cuff by Night Lily Design and my tiger lily flower magnet. Enjoy Late Summer Flowers and Sunpuddles with a Kitty or Two! I've only ever been to a Renaissance Faire once, and it was a long time ago. I remember it was great fun, though. Thanks so much for this link up. So much great and beautiful stuff to take in!!! Great Collection, looking forward to more!